What Sets AllEarz Savannahs Apart From Other Breeders? We are a small in-home cattery specializing in providing loving pet homes with exemplary spoiled, spotted Savannah kittens! We have been actively involved in the Savannah community since 2004- from showing in TICA cat shows in Nevada, California, and Arizona, to assisting breed rescue and actively participating in our breed group, we have devoted our lives to this stunning breed of cat! We raise our kittens underfoot with a lot of love and TLC. Our kittens are handled from birth and will be exposed to cats, dogs, and children before leaving our home and entering yours. AllEarz follows a strict set of ethical guidelines that we believe ensures our kittens are as healthy, socialized, and well raised as possible. We recommend, regardless of the breeder you purchase a kitten from, that you ensure they follow the same basic ethical guidelines. 1. Our kittens do not leave our home until they have received at least TWO sets of vaccines. A kitten does not have a proper immune system to go home at 6 weeks or 8 weeks of age. Kittens need the first 10-12 weeks of life not only to build a proper immune system response to vaccines, but also to learn from their mother and littermates in regard to socialization and litterbox training. 2. Our kittens ALWAYS go home with a signed contract and a health guarantee. A contract before buyer and breeder provides both parties a suitable guideline of expectations for the lifetime of the kitten. 3. Our kittens go home SPAYED or NEUTERED before placement in a pet home. 4. We will only consider placing kittens with new breeders if the breeder is willing and able to be mentored through the development of their breeding program. Our breed is built upon COMMUNITY and it is our responsibility to ensure the community is composed of not only great pet owners, but knowledgeable and gifted breeders. 5. 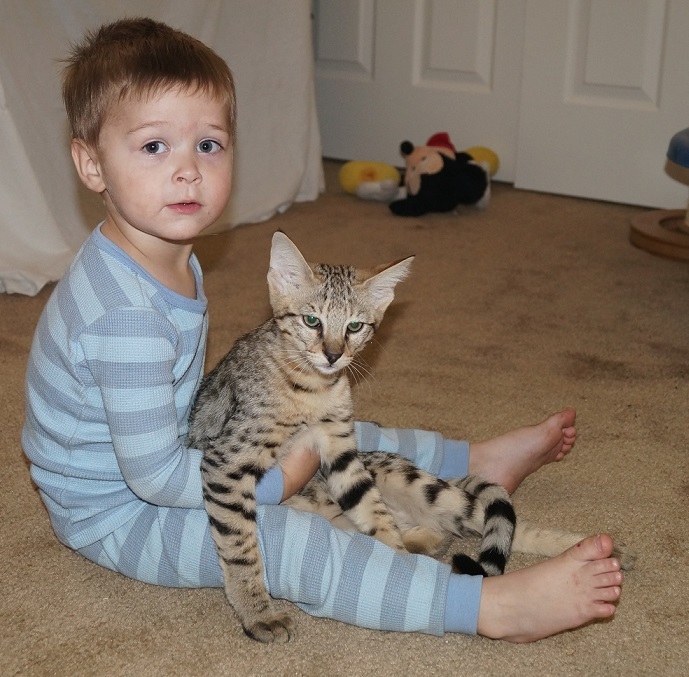 We are always willing to assist Savannah Cat Rescue, the national rescue group, for any Savannah in need and we will ALWAYS assist any of our owners in regard to one of our own kittens/cats for the lifetime of our babies. While these are just our basic code of ethics at AllEarz Savannahs, we think it helps you understand our philosophy in regard to raising these wonderful spoiled, spotted Savannahs! We think all breeders should follow the same basic philosophies in order to raise happy, healthy, thriving kittens and to place them into great pet homes! If you have any questions or comments, please feel free to email us at allearzsavannahs@gmail.com. We love chatting about our breed and love ensuring potential new owners understand the wonderful nature of these silly, energetic, intelligent cats!